Description Giovanni Bellini was the leading Venetian artist of his era and particularly known for his naturalistic depiction of light. He and members of his workshop painted this work as a commemorative piece to adorn the rooms of the Procuratia di Ultra, one of the most important public offices of the Republic of Venice. 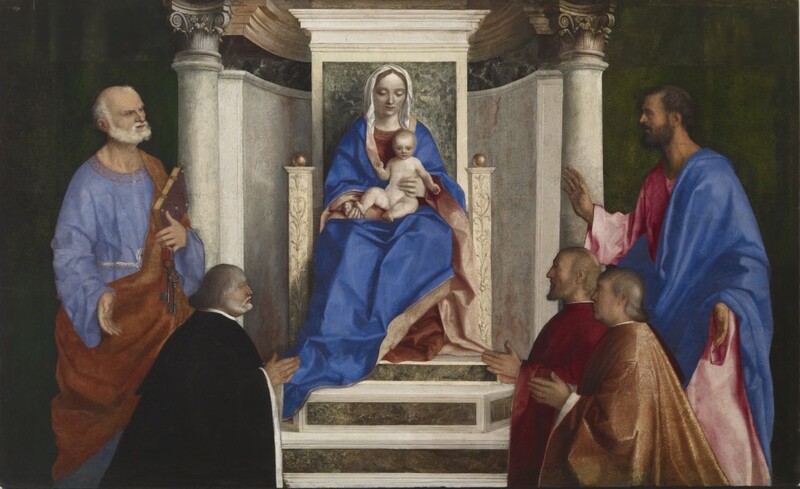 The procurators, high-ranking officials who administered public affairs and resolved judicial disputes, are depicted as kneeling donors before the Madonna and Child, who are seated on a lavish throne. They have been identified as Tomaso Mocenigo, Luca Zeno, and Domenico Trevisano. The saints are the apostle Peter with his keys to Paradise and Mark, one of the patron saints of Venice. The painting was made as a votive offering, thanking the Virgin for her protection of the Venetian Republic. Giovanni Bellini. Scuderie del Quirinale, Roma; Musei Civici Veneziani, Venezia. 2008-2009. Glory of Venice: Masterworks of the Renaissance. Denver Art Museum, Denver; North Carolina Museum of Art, Raleigh. 2016-2017.